Moviegoers, do not miss to watch the movie “Under the Sea 3D” a new IMAX 3D undersea adventure. The movie is due to be released in theaters this Friday, the 13th. from Husband and wife team Howard Hall (Director) and Michele Hall (Producer). filmed in the Coral Triangle (Indonesia and Papua New Guinea) and South Australia. explores the wonders of the oceans. gives an opportunity to view the ocean world and helps to understand the marine life. bound to create awareness on the impact of global climate change and the need to protect marine life including the reefs. pleasure to watch in crystal clear, larger images. Here is an amazing video clip of Under the Sea 3D. Here is one more video clip: The Great Barrier Reef. 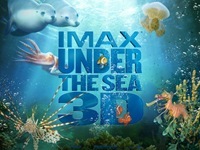 For more information, log on to IMAX – Under the Sea 3D.